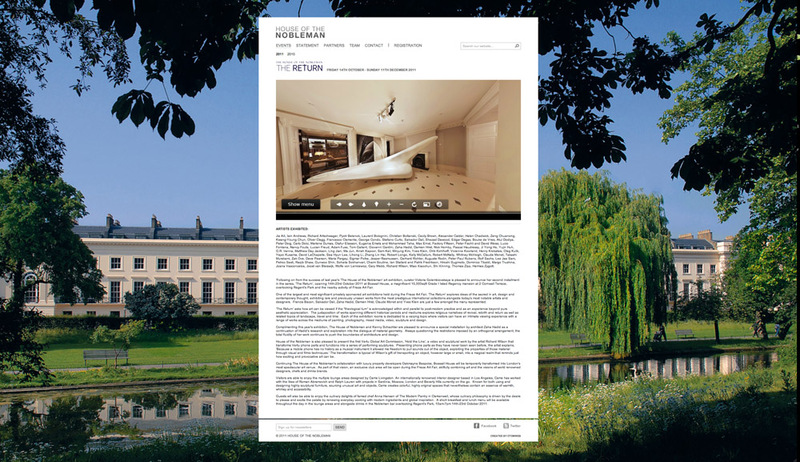 Following on from the success of last year’s ‘The House of the Nobleman’ art exhibition, curator Victoria Golembiovskaya announced her second installment in the series, ‘The Return’ at Boswall House, a magnificent 15,000sqft Grade I listed Regency mansion at 2 Cornwall Terrace, overlooking Regent’s Park and the nearby activity of Frieze Art Fair. One of the largest and most significant privately sponsored art exhibitions held during the Frieze Art Fair and running on to the end of the year, ‘The Return’ explores ideas of the sacred in art, design and contemporary thought, exhibiting rare and previously unseen works from the most prestigious international collections alongside today’s most notable artists and designers. Francis Bacon, Salvador Dali, Zaha Hadid, Damien Hirst, Claude Monet and Yves Klein are just a few amongst the many represented. ‘The Return’ asks how art can be viewed if the “theological turn” is acknowledged within and parallel to post-modern practice and as an experience beyond pure aesthetic appreciation. The juxtaposition of works spanning different historical periods and mediums explores religious narratives of revival, rebirth and return as well as related topics of landscape, travel and time. Each of the exhibition rooms is dedicated to a varying topic where visitors can have an intimate viewing experience with a range of works across the mediums of painting, photography, mixed media, video, sculpture and design. Three pieces from my ‘Swarm’ series including a 160×160 large blue Morpho Amathonto have been selected by Miss Golembiovskaya to hang alongside works by; Jia Aili, Iain Andrews, Richard Artschwager, Pyotr Belenok, Laurent Bolognini, Christian Boltanski, Cecily Brown, Alexander Calder, Helen Chadwick, Zeng Chuanxing, Kwang-Young Chun, Oliver Clegg, Francesco Clemente, George Condo, Stefano Curto, Salvador Dali, Shezad Dawood, Edgar Degas, Bouke de Vries, Atul Dodiya, Peter Doig, Carlo Dolci, Marlene Dumas, Olafur Eliasson, Eugenia Emets and Mohammad Taha, Max Ernst, Factory Fifteen, Peter Fischli and David Weiss, Lucio Fontana, Nancy Fouts, Lucian Freud, Adam Fuss, Giovanni Gardini, Zaha Hadid, Damien Hirst, Nick Hornby, Pascal Haudressy, Ji Yong Ho, Yujin Huh, G.R. Iranna, Matthew Day Jackson, Ling Jian, Ma Jun, Anish Kapoor, Sam Keil, Minjung Kim, Yves Klein, Olrik Kohlhoff, Vivienne Koorland, Henry Krokatsis, Oleg Kulik, Yayoi Kusama, David LaChapelle, Sea Hyun Lee, Lihong Li, Zhang Lin Hai, Robert Longo, Kelly McCallum, Robert McNally, Whitney McVeigh, Claude Monet, Takashi Murakami, Zak Ove, Dave Pearson, Maria Pergay, Sigmar Polke, Jesper Rasmussen, Gerhard Richter, Auguste Rodin, Peter Paul Rubens, Rolf Sachs, Lee Jae Sam, Petroc Sesti, Raqib Shaw, Gunwoo Shin, Soheila Sokhanvari, Chaim Soutine, Ian Stallard and Patrik Fredrikson, Hiroshi Sugimoto, Dominico Tibaldi, Margo Trushina, Joana Vasconcelos, Joost van Bleiswijk, Wolfe von Lenkiewicz, Gary Webb, Richard Wilson, Miao Xiaochun, Shi Xinning, Thomas Zipp, Hermes Zygott.